What's black and white and read all over, at least in the Green Mountain state. OK, yes, I realize that Klondike doggerel is both inappropriate to and unworthy of America's 14th state, Vermont, and its largest city, Burlington. But after a stretch of seeing Burlington-area Burmese refugees, energy-efficiency pioneers, dot-com successes, urban-development theorists, manufacturing innovators, food-and-beer entrepreneurs, activists for and against bringing F-35s to town, local pols and business people, and others, I feel propelled into the "queerest they ever did see" realm by one particular discovery. Is on pace for its best year ever in total revenue, up by more than 20% from its high before the crash of 2008. 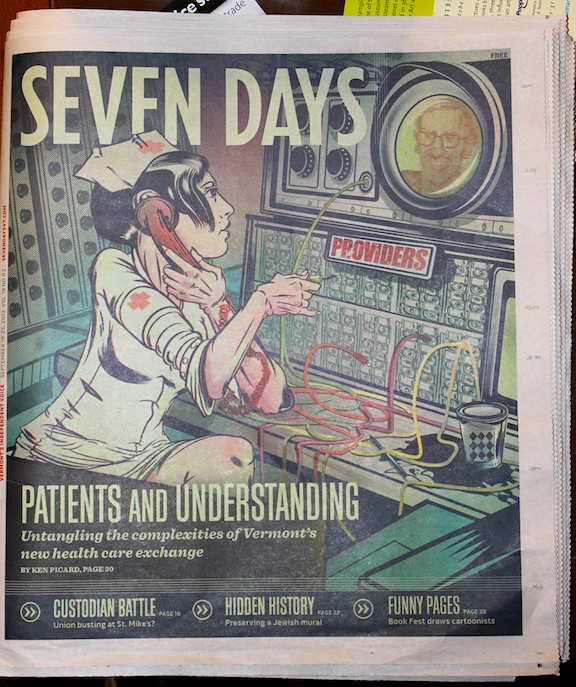 The paper I am describing is Seven Days, which started out as an artsy alt-weekly but has increasing momentum as a news-and-culture source (even while the mainstay Burlington Free Press has been buffeted in a fashion more typical of the news business as a whole). For instance, the issue that came out yesterday, at right, has a detailed cover story about the specific ways in which the Obamacare / health exchange era will affect people of different ages, incomes, and health situations. What has kept the paper going, and growing, seems connected to the economic and cultural power of locally conscious sentiment in the town as a whole, about which there will be more to say. For now, two comments from its publisher, co-founder, and co-editor Paula Routly. 1) On the print business overall: "My biggest problem is the 'death of print' doom and gloom talk, which scares advertisers into thinking no one will see their ads. But as long as people keep picking up our paper, which they do, the ads get seen." 2) On a reason why this paper is working, when many others aren't (apart from the un-wired status of much of Vermont, which impedes online growth): "People look at our paper and it makes them happy and interested to be here. That motivates them to do something, and participate -- which makes it more a community, and gives us something to cover. It’s a cycle that works." After seeing our set of cities over the past few weeks, the ineffable but powerful roles of "community," participation, and local consciousness loom larger in my own awareness than they did before. To be continued.